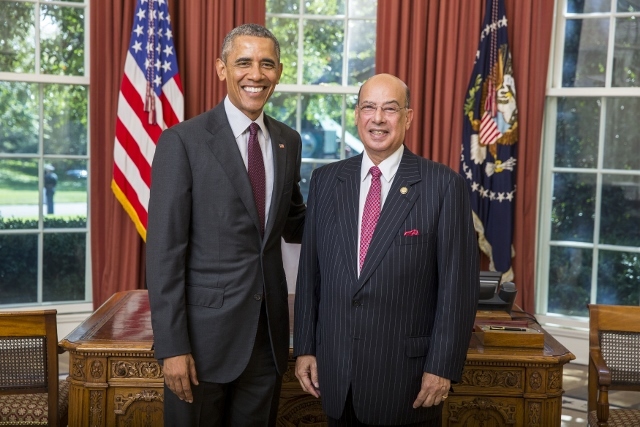 Sir Ronald Sanders is currently Ambassador Extraordinary and Plenipotentiary to the United States and the Organisation of American States (since 2015) and non-resident High Commissioner to Canada (since 2017) for Antigua and Barbuda, Before taking up this appointment in 2015, he was a Senior Research Fellow at the Institute of Commonwealth Studies, University of London in the UK and a Senior Fellow at Massey College, University of Toronto. He is "on leave" from these positions. He was also an International Business Consultant and Writer. Sir Ronald has had careers as a diplomat, businessman and academic and brings a range of skills, honed in these separate areas to his work as negotiator, diplomatist, facilitator and mediator and market strategist in business and politics. From January to April 2016, he served as President of the Permanent Council of the 34-member Organisation of American States where he initiated action to recover the Organisation from severe fiancial difficulties. He also successfully led a Special Mission to Haiti that helped to formulate a solution to a constitutional and political impasse that avoided civil strife and allowed the country to enter a peaceful phase, preparing for Presidential elections. In July 2010 Sir Ronald was appointed as one of 10 members of an Eminent Persons Group (EPG) which was requested by Commonwealth Heads of Government to recommend options for reform that will sharpen the impact of the 53-nation Commonwealth, strengthen its networks and raise its profile. The report of the Group, to which Sanders was also Rapporteur, was submitted to the Commonwealth Heads of Government Meeting in Perth in 2011 where it dominated the Conference. He is also a (non-remunerated) member of the International Advisory Board of the Round Table: The Commonwealth Journal of International Affairs which is a scholarly journal published six times a year. Founded in 1910, The Round Table is Britain's oldest international affairs journal, providing analysis and commentary on all aspects of international affairs. In the private sector he has served on the Board of Directors of Financial Institutions, Telecom Companies, Media Companies and a Sustainable Forestry Company in Antigua and Barbuda, Belize, Barbados, Guyana, and the US Virgin Islands. In the public sector he has served as the elected Chairman of the Caribbean Financial Action Task Force against drug trafficking and money laundering (2003-2004). He also served on the Board of the International Programme for the Development of Communication at UNESCO (1983-1985) and as an elected member of the Executive Board of UNESCO (1985-1987). In his diplomatic career he spanned two previous periods between 1982 to 1987 and 1996 to 2004. He was twice High Commissioner to the United Kingdom for Antigua and Barbuda and Ambassador to the World Trade Organisation (WTO). He had special responsibilities for negotiations on financial and trade matters in the WTO and with the International Monetary Fund and the Organization for Economic Cooperation and Development (OECD). He attended Commonwealth and CARICOM Foreign Ministers and Heads of Governments Conferences throughout his diplomatic career. He served on numerous committees, task forces and advisory boards to formulate and implement policy for the Caribbean and the Commonwealth. He also has experience of dealing with regulatory bodies such as the FCC in the US, and he has led a successful complaint to an arbitration panel of the World Trade Organisation. He has negotiated Tax Information Exchange Agreements and Double Taxation Agreements with Britain, the US and Australia and loan and investment agreements with Britain and China. His consultancies include work in public affairs for the Organisation of Eastern Caribbean States (OECS), the Commonwealth Secretariat, the International Foundation for Animal Welfare (IFAW) and UNESCO, as well as private companies where he has negotiated acquisitions and financing and advised on corporate policy and public affairs. Sir Ronald is the recipient of several honours, including Knight Commander of the Order of St Michael and St George (KCMG); Knight Commander of the Order of the Nation (KCN), member of the Order of Austraila (AM). He was also honoured by the University of the West Indies with the Honorary Degree of Doctor of Letters (DLitt) for his championship of Caribbean causes as a diplomat, writer and advocate. A former Visiting Fellow at Oxford University, he holds a MA in International relations from the University of Sussex, and he is the author of several publications on small states in the international political economy including “Crumbled Small: The Commonwealth Caribbean in World Politics" (London, 2005). He writes a commentary in leading newspapers throughout the Caribbean and on several Internet News for which he accepts no payment in order to retain independent expression of views. Sanders is frequently interviewed on Caribbean and Commonwealth matters by the BBC (UK), CANA (Caribbean) the Latin American Advisor (USA), Radio stations in Jamaica and elsewhere in the Caribbean, and other international media. He has been invited by the Governments of Canada, the United Kingdom and CARICOM to participate in Think-Tanks and Seminars. He has been a guest lecturer at the Royal Institute of International Affairs, The Royal College of Defence Studies, Bristol University and London Metropolitan University.